A consensus study report issued by the National Academies of Sciences, Engineering, and Medicine on Dec. 6 recommends an annual investment of $57 billion in the U.S. interstate system, a near-term increase in federal fuel taxes indexed to inflation and accounting improvements in vehicle fuel mileage, plus a long-term changeover to tolling and vehicle miles traveled or VMT fees to generate future highway funding. “Our interstate system is aging and not gracefully; its health requires a lot more attention than in the past and the monies needed to maintain it are increasing as every year goes by,” explained Neil Pedersen, executive director of the NASEM’s Transportation Research Board, during a press event in Washington D.C. The report – entitled “Renewing the National Commitment to the Interstate Highway System: A Foundation for the Future” – proposes a 20-year roadmap for upgrading the Interstate Highway System via a Renewal and Modernization Program or RAMP that would: focus on reconstructing deteriorated pavements and their foundations; rebuilding bridge infrastructure; adding physical capacity where needed; and increasing the system’s resilience so it can better withstand the impact of weather events and climate change. To renew and modernize U.S. highways over the next 20 years, the report calculates that between $45 billion and $70 billion will be required annually depending on “uncertainties,” such as the rate of growth of vehicle miles traveled. Yet it stressed that those estimates may be low, because they do not include funding required to reconfigure and reconstruct many of the interstate system’s 15,000 interchanges or make the system more resilient to the effects of climate change. The average annual recommended investment in the nation’s interstate system is $57 billion, the report noted, which is comprised of $29 billion for pavement reconstruction, $4 billion for bridges, $22 billion for capacity expansion, and $2 billion for operational measures. To raise that revenue, the NASEM report recommended increasing the federal fuel tax in the near term and allowing tolls or per-mile charges on interstate users in the future. 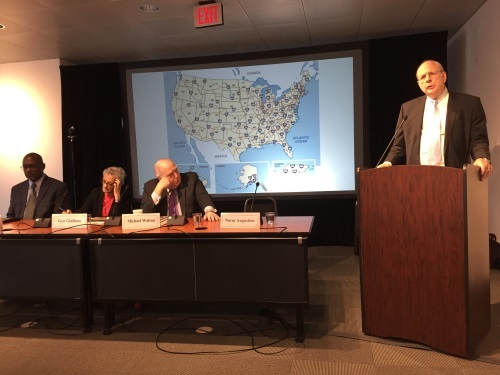 “Our highways are exceeding their design lives already and many are not connected to cities seeing surges in population and economic growth,” noted Norman Augustine, former chairman and CEO of Lockheed Martin Corp. and chair of the NASEM report committee, during the press event. Augustine also stressed that “new factors” are emerging where interstate construction and maintenance are concerned, especially as more vehicles are powered by electricity and drive themselves.